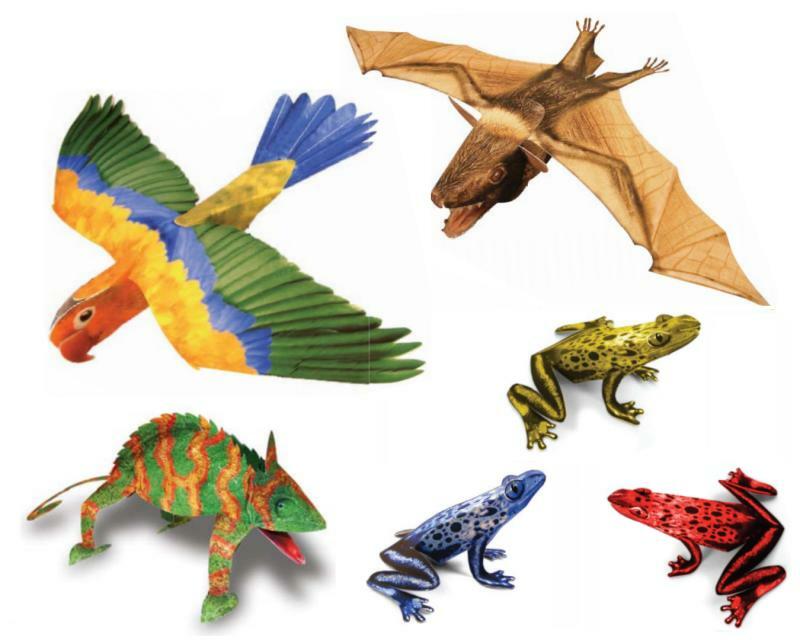 These free paper model animals are offered by the Scholastic company (a distributor of children's books) as a way to educate kids about the rainforest biome. The six models offered include a parrot, a chameleon, a fruit bat and three different colored tree frogs. The templates for the animals are in PDF format and may be downloaded here. 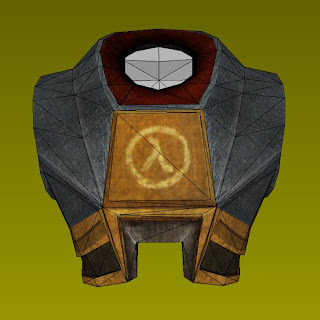 I was working on the final piece of papercraft armor for the Half-Life HEV Suit I started in April last year, when I discovered that someone had beat me to it! So I am posting their HEV Suit chest armor instead of my own. 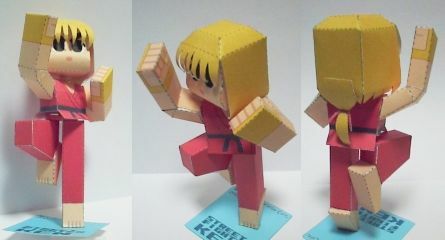 This papercraft was unfolded by my DeviantART papercrafter friend, Brandon. I may go ahead and release my own version too, if the mood strikes me, but for now you can consider this the final release of the HEV Suit papercraft series. The PDF template may be downloaded here. UPDATE 10/5/12: A unlocked PDO of the chest armor is now available... here. 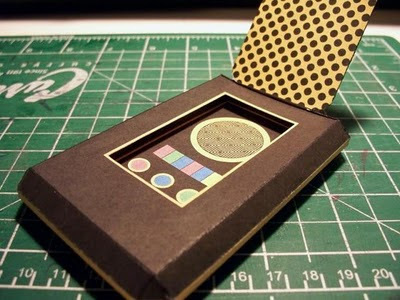 Here's a paper model of a communicator reminiscent of the ones used in the original Star Trek television series from the 60's. Purists will recognize that this model is not exactly like the original communicator props, but it is still a lot of fun to build, especially considering that it only has two parts (believe it or not!) The communicator template was created in Coreldraw by DeviantART member Frohickey and may be downloaded from his gallery. Green Lantern, a DC Comics' superhero, will finally make it to the big screen this June. There have been several versions of Green Lantern in comic books since the 1940's, but the upcoming movie will feature Hal Jordan, the Silver Age version of the character. One thing common to all Green Lanterns over the years is a green mask. Pictured above is a papercraft version of Green Lantern's mask by Dancin_Fool at 405th.com. 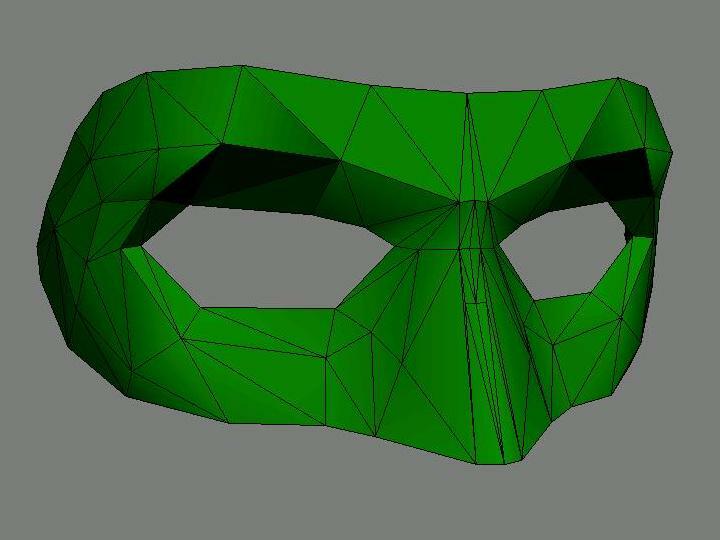 The template for the mask is available in Pepakura PDO format only and comes uncolored (white), so if you want the green color shown, either you will need to modify the unlocked PDO or paint the mask after it is built. The mask template may be downloaded here. 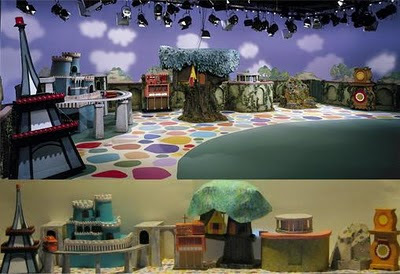 The "Neighborhood of Make-Believe" is a pretend kingdom that appears in the children's television show Mister Rogers' Neighborhood. Most of the inhabitants of the kingdom are hand puppets voiced by the show's host, Fred Rogers. When Texas musician Francis McGrath had trouble finding a papercraft version of the Neighborhood of Make-Believe, he decided to create one himself. Shown in the lower portion of the photo above is the result of his efforts. Templates for each of the Neighborhood of Make-Believe buildings (plus a template for the familiar red trolley) are located at McGrath's web page here. The term "2.5D" is a very appropriate description for the papercraft figures that are often created for miniature gaming. They are more than just flat 2D paper figures, but something less than a full blown 3D paper model. 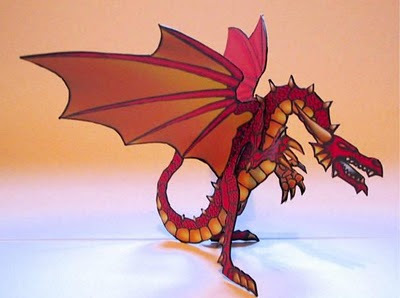 This red dragon paper model is one of the better examples to be found of the art of 2.5D modeling. Created by ONE-MONK, the PDF template for the dragon may be downloaded here. 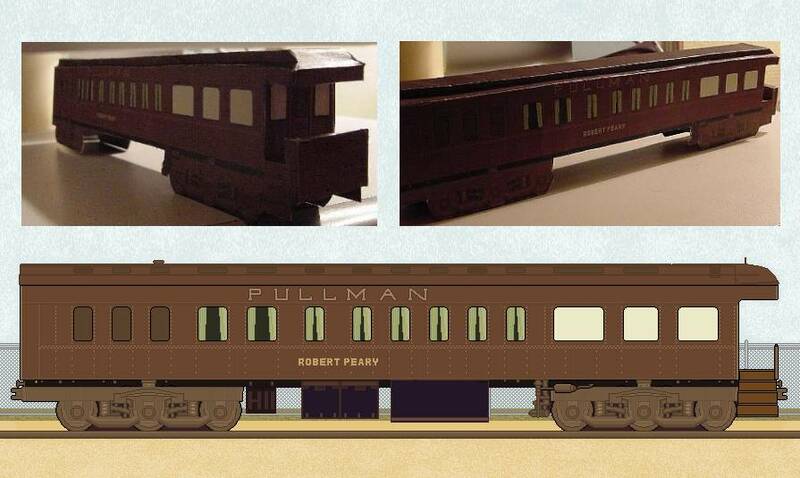 This easy-to-build Pullman railroad car paper model was designed by Lubbert Schenk of Holland. Pullman cars were luxury sleeping cars that contained amenities such as carpeting, draperies, upholstered chairs and washrooms. The Pullman Palace Car Company produced their cars from the 1860's through the 1960's. The template for the railroad car may be obtained by clicking on the image of the Pullman car on Mr. Schenk's webpage. Here is Chest #2 in my ongoing series of Kingdom Hearts 2 treasure chest paper models. My goal is to release one treasure chest a month with a final total of fourteen chests. 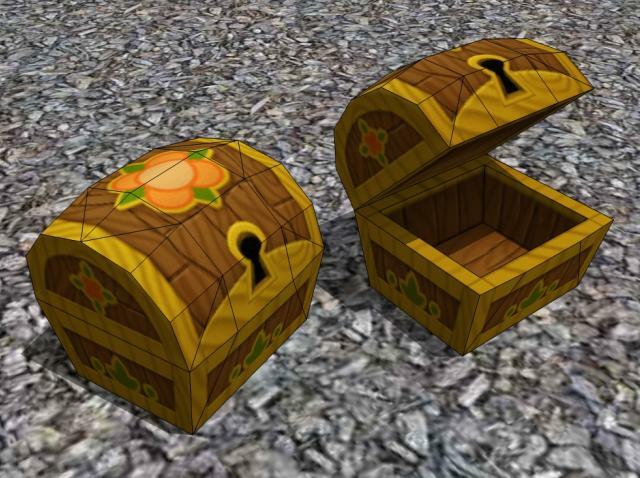 This treasure chest appears in the 100 Acre Wood area of the video game. The 100 Acre Wood is, of course, where Winnie the Pooh and his companions live. The graphic style of Pooh and friends in the video game corresponds to Disney's version of the characters rather than the original book illustrations by E. H. Shepard. Lined and un-lined PDF templates for the chest are available here. In recent months I have come to appreciate 3D paper pop-ups as a form of papercraft. 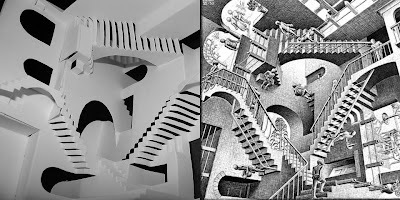 One of my favorite pop-ups is this one based on Relativity, a 1953 lithograph by artist M. C. Escher. This glue-less pop-up was built out of a single sheet of standard size cardstock by Flickr member Bryan Peele. If you are interested in building one yourself, Bryan's template for the pop-up may be found here. Monster paper toys, you gotta love them. :) This one-eyed, flame-headed monster with tentacles for arms was created by Adam Bernardo using Dolly Oblong's "paper totem" template as a guide. Want to build one? 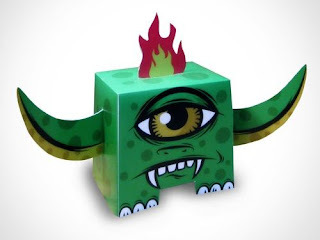 Adam has the template for his monster paper toy posted on his blog here. In the Agrabah (Disney Aladdin) area of the Kingdom Hearts 1 video game, the player must enter the "Cave of Wonders". 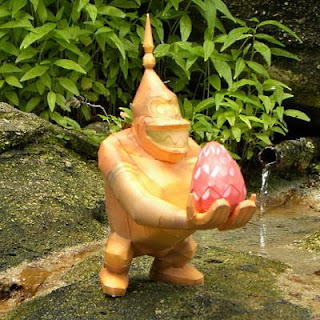 Among other things inside the Cave of Wonders are statues of apes holding enormous gems. This paper model is of one of those statues. The build photo above is by TouchFuzzyGetDizzy, the designer of the papercraft. He has made his Pepakura PDO template for the statue available on DeviantART. "...contain a variety of functions which the Predators may require during a hunt. 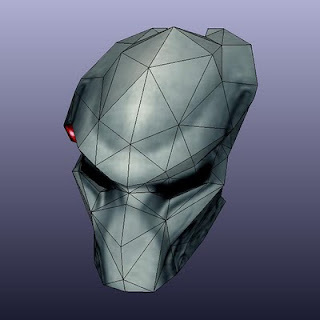 As well as protecting the Predator's head, the mask has a sound amplifier, multiple vision modes, a zoom function, some diagnostic capabilities and a recording system. The bio mask may also have a red targeting laser, used by a Predator for accurate plasma caster shots." The template for the mask is available in both PDF and Pepakura PDO format, both of which may be downloaded here.